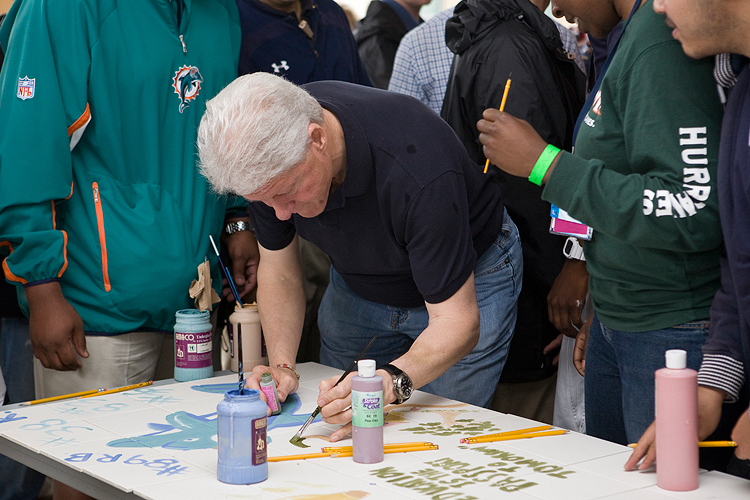 President Bill Clinton completes a tiled mural for Carrfour Supportive Housing’s future Verde Gardens community in Miami for 145 formerly homeless families during a day of service with students from the Clinton Global Initiative University. Former President Bill Clinton led hundreds of young volunteers, athletes, and celebrities to Carrfour Supportive Housing’s future Verde Gardens community in Homestead Sunday for a day of service as part of the Clinton Global Initiative University’s (CGIU) weekend program in Miami. 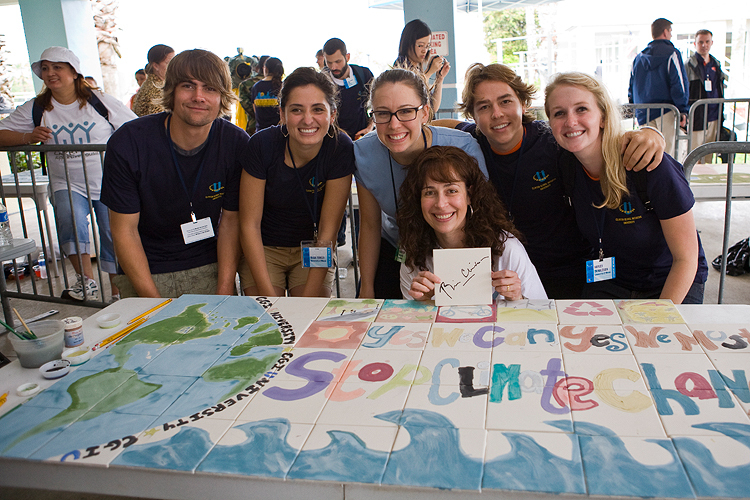 Carrfour staff and volunteers, along with volunteers from PAIRS Foundation and other local nonprofits, worked with CGIU students to create inspiring tiled murals that will be placed throughout the Verde Gardens community when the doors open to 145 formerly homeless families next spring. 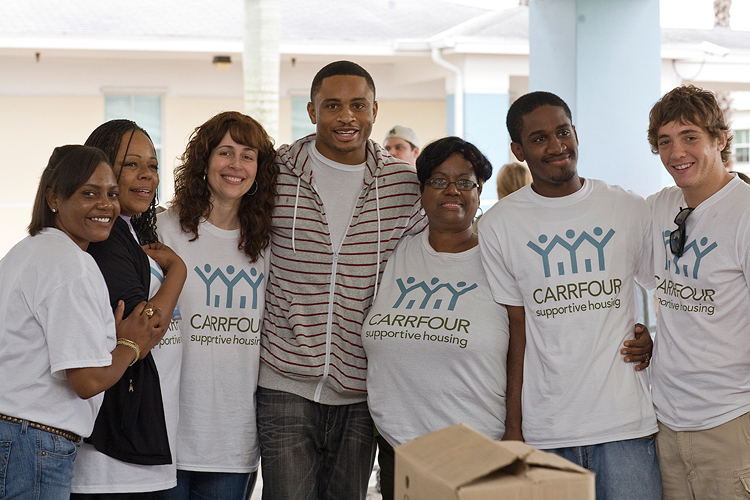 Oakland Raider Nnamdi Asomugha with Stephanie Berman-Eisenberg and volunteers from Carrfour Supportive Housing and PAIRS Foundation during CGIU day of service at Carrfour’s future Verde Gardens community. Stephanie Berman-Eisenberg, President of Carrfour Supportive Housing, thanked President Clinton for providing leadership on behalf of eradicating homelessness in America. Carrfour’s Verde Gardens Apartments, a complex of 145 units of new affordable housing for formerly homeless families, will include an organic produce nursery, and a farmers market retail site on the former Homestead Airforce Base, which closed as a result of Hurricane Andrew. Construction of the community is being funded through the Miami-Dade County Homeless Trust. Actress Heather Graham with Stephanie Berman-Eisenberg and Zachary Eisenberg during Clinton Global Initiative Day of Service at site of Carrfour’s future Verde Gardens community. The project was recently featured in TIME Magazine as an example of innovative projects in development that combine housing for the formerly homeless within environmentally friendly communities in which residents are able to participate and benefit from unique agricultural programs. President Bill Clinton and basketball legend Alonzo Mourning open the Clinton Global Initiative’s Day of Service at site of future Carrfour Verde Garden’s community in Miami. 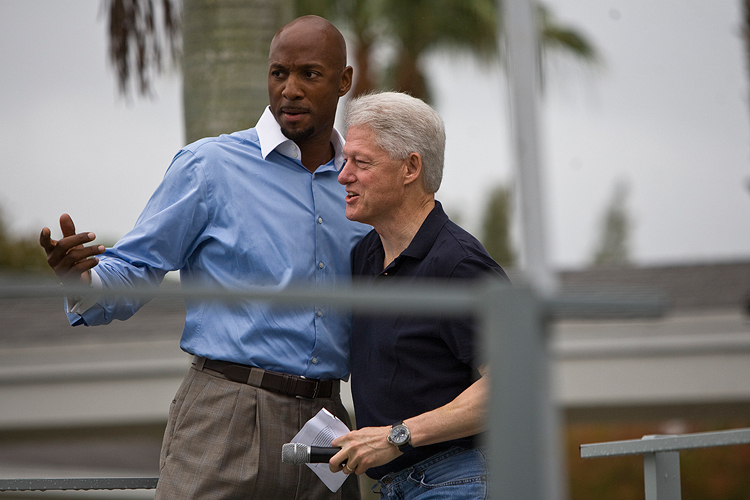 Basketball legend Alonzo Mourning joined President Clinton in urging young people to actively contribute their passions, talents and resources so that their lives make a difference in the world. Carrfour Supportive Housing President Stephanie Berman-Eisenberg holds tile signed by former President Bill Clinton with group of volunteers from the Clinton Global Initiative during day of service at future Carrfour Verde Gardens community. The students from the Clinton Global Initiative were also joined by celebrities such as Heather Graham, NFL players from the Miami Dolphins and Oakland Raider Nnamdi Asomugha, athletes from the University of Miami, and many others. Carrfour Supportive Housing is a 501(c)(3) nonprofit established in 1993 by the Miami-Dade Chamber of Commerce to eradicate homelessness in Miami-Dade County. The organization provides affordable housing and supportive services to more than 1,000 families in communities across Miami-Dade County.